Hire a Skip: Delivered From Only £96. Our skips range from 2yrds to 40yrds. Lowmac have a fantastic reputation for the service and variety of skips we offer to our clients. With a vast range of skips available from 4 yards – 40 yards, containers and compaction units we have something for everyone. We offer for hire 4 yard – 40 yard skips, open and enclosed available where necessary. We offer for hire 20 yard – 40 yard containers, open and enclosed available where necessary. We offer for hire 14 yard skips and 35/40 yard Compaction Containers. We offer for hire Compaction Units both new and refurbished over a 3 to 5 year period, which are available for purchase at the end of the fixed term rental agreement. We offer for hire on an hourly rate with driver provided : Skip, RoRo, Tippers and Ejection Trailers. 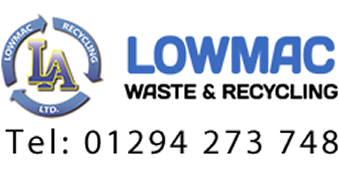 Lowmac Alloys Ltd currently offer food waste collections ranging from small compact containers through to 220Ltr bin collections. I wish to order a skip for my house, do I need a permit? When placing an order with Lowmac Alloys Ltd, one of our dedicated team will advise at the point of ordering. If necessary, we will place the request with the local authority ensuring your skip is fully compliant. I have paint waste, can this go in my general waste bin? Paint Waste is classified as hazardous under the European Waste Catalogue. Our Hazardous Waste department can provide a competitive quote to ensure you stay environmentally compliant when recycling! How much will a skip cost? At Lowmac Alloys Ltd, we have a variety of skips available for hire. Our skips range from 4yrds to 40yrds. Our sales department can provide an exact cost for you skip. How quickly can I have my skip delivered? Lowmac Alloys Ltd provide an fantastic service when hiring our skips. We aim to have the skip delivered within 24hrs of ordering! How long can I have a skip at my house? Lowmac Alloys Ltd are happy to provide a skip for upto 10 days inclusive of your cost! How do I contact Lowmac Alloys? Below are the address and telephone numbers for both our Irvine and Ayr office. For contact details for specifc departments, please refer to our Contact page. Irvine Office Unit 22 Oldhall West Industrial Estate, KA11 5DG 01294 273 232 Ayr Office Weir Road, Ayr, KA8 8BD 01292 880 400 Alternatively, you can use the contact us form.